With the successes of local boys Rory McIlroy, Graeme McDowell and Darren Clarke on the global golfing circuit, and the return of the The Open to Royal Portrush Golf Club in 2019, there’s never been a better time to indulge in Northern Ireland’s top golf and spa resorts. 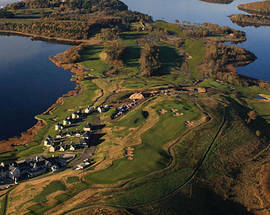 Lough Erne Resort I-4, Belleek Rd, Enniskillen, Co. Fermanagh, tel. (+44) (0)28 6632 3230, www.lougherneresort.com. 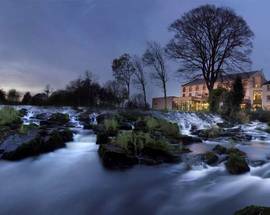 A sedate two hour drive from Belfast, and just outside the Co. Fermanagh town of Enniskillen, sprawls this magnificent retreat. Set on its own private 600 acre peninsula, the Resort’s sweeping vista encompasses two silvery lakes dotted with dozen of tiny islands. It was also the location of 2013's G8 Summit when world leaders including Obama, Putin and Merkel talked turkey amid its tranquil setting. The Resort is divided into the main hotel with 51 rooms and suites, and 61 detached two and three-bed lodges, many with a charming turret-style design. Its pale cream exterior stands out dramatically from the verdant backdrop, and the old world heritage and new world luxury style ethos ensures everything from the foyer, restaurants and library to the bedrooms and suites themselves, exude traditional elegance and antique touches. Step into the bedroom and you’re immediately wowed with that uninterrupted lake view. A claw-foot bath and separate shower keep the luxe touches coming. The Thai Spa tempts with an array of Asian treatments. Your journey East begins with an Aroma Crystal Steam Room, Light Therapy Sauna and Tropical Rain Shower, before your Thai therapist delivers a rejuvenating elixir. Treat yourself to a Ritual Thai massage, exotic body scrub, botanical body wrap, or detoxifying mud rasul for up to four people before skipping carefree to the infinity pool for a few languid lakeview laps. The 10th hole at Lough Erne is arguably one of the most daunting in golf, because the green is almost completely surrounded by water. This is one of the many breathtaking features of the par-72 Championship examination designed by Nick Faldo, and opened in July 2009. Along with the tantalising 10th, water comes into play at 13 other holes on a course measuring 7,167 yards off the back sticks. The complex includes the Loughside Clubhouse that has every golfing facility imaginable. Completing the attractions is the mature par-72 Castle Hume Championship parkland course that was opened in 1991, and has Shaun Donnelly the Club professional. Head Chef Noel McMeel has worked wonders with local produce to bring culinary excellence to your plate. From breakfast to evening dinner, everything from the service and presentation to the food and drink is second to none. 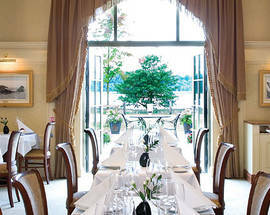 His menu of modern Irish cuisine includes Salad of Kilkeel Crab and Loin of Finnebrogue Venison in The Catalina restaurant, Irish Oak Smoked Salmon and Slow Braised Telfords Pork Belly on The Blaney Bar’s ‘Grazing Menu’ and The Loughside Bar & Grill’s Kettyle Fermanagh Prime Beef Grill ensemble to satiate all you golfers. Binoculars in the bedroom, double baths in the sumptuous suites and a voucher for Free Tours of the nearby Belleek Pottery are among our faves. If you fancy a splurge, overnight in the Faldo Suite with its fabulous four poster bed overlooking stunning views across that eponymous course. The Resort was named Hotel of the Year at the 2014 Northern Ireland Tourism Awards - a heartily deserved plaudit. 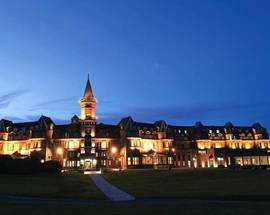 Slieve Donard Resort and Spa L-4, Downs Rd, Newcastle, Co. Down, tel. 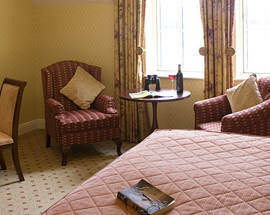 (+44) (0)28 4372 1066, www.hastingshotels.com. 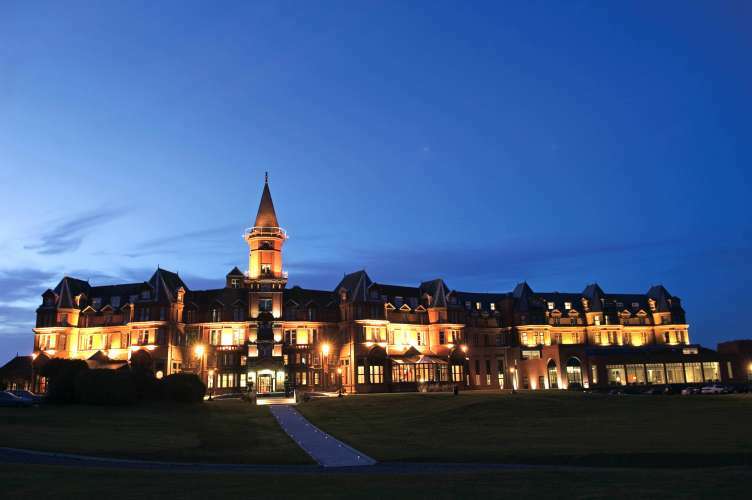 Where the Mountains of Mourne sweep down to the sea stands this beautifully restored Victorian era hotel. With the Irish Sea and stretch of sandy beach on one side, and Royal County Down golf course on the other, this imposing building dominates the seaside town of Newcastle and is nothing short of a local legend. Find it just under one hour’s drive from Belfast. A £15m development has elevated the old girl to luxurious levels, without compromising its 19th Century grandeur. Most rooms come with ‘wow factor’ sea and mountain views, and the suites take the experience up another notch with fireplaces, iPod docks and what can only be described as a disco bath – in-built lights change colour while you soak. Love it! Sumptuous and spacious, this relatively new addition to the Slieve Donard experience ensures your relaxing break lives up to its billing. 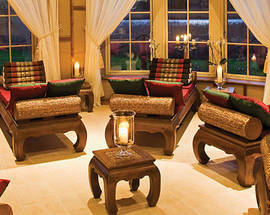 Two levels really make the most of those views, and the ESPA therapies are indulged across 16 treatment rooms. 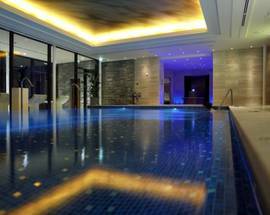 A 20m Swimming Pool, Vitality Pool and a heady array of steam, sauna, shower and spa experiences keep the skin tingling. Why not try the Jet Lag Reviver Wrap and Jet Lag Eliminating Massage pre- and post-stay? They really do think of everything. Visitors from all parts of the globe make the pilgrimage to play the iconic links of Royal County Down, and are never disappointed. They savour the twin delights of the superb seaside course and the stunning scenery of the area. Many experts regard the par-71 course as the most outstanding test of links golf in the world. American multi-Major winner Tom Watson, who competed there during the European Senior British Open, described the course as - "the finest most natural links I have ever played." 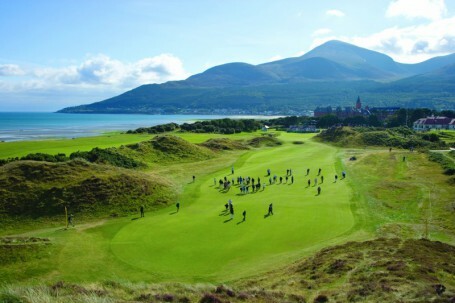 Proof of Watson's opinion is backed by Royal County Down's fourth-placed ranking among the best courses on the planet. Rory Doran, an assistant to RCD professional Kevin Whitsun, said: "We are listed the best course outside of the United States. In recent times, we extended the par four 16th hole by 30 yards, making it more difficult than when it was reachable off the tee. This adds to the standing of the course." Royal County Down includes some of the strongest short holes in seaside golf - starting with the 212-yards fourth, and no mater the weather conditions always proves an exacting examination. The hotel’s home-grown menu mantra is neatly encapsulated in a Food Provenance booklet which showcases the local origins of its bread, meats and dairy delights. Which means, whether dining in The Oak Restaurant or Percy French Inn - a pub-style bistro located near the entrance of the six acre Resort, you’re guaranteed a great feed of gourmet Irish grub. 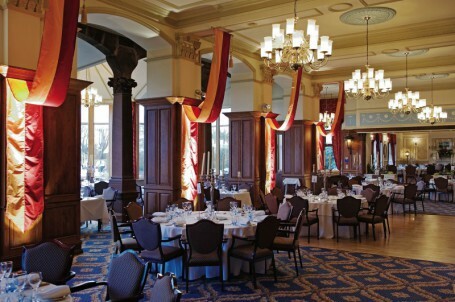 The Lighthouse Lounge beside the Spa is the place to head for healthy lunches and the Slieve Donard Afternoon Tea. The foyer’s mini Museum recalls over 100 years of Slieve Donard history, from its majestic railway hotel origins to VIP overnights from an impressive roll call of big names including Desmond Tutu, Michael Douglas & Catherine Zeta Jones and Charlie Chaplin, after whom the bar is named. 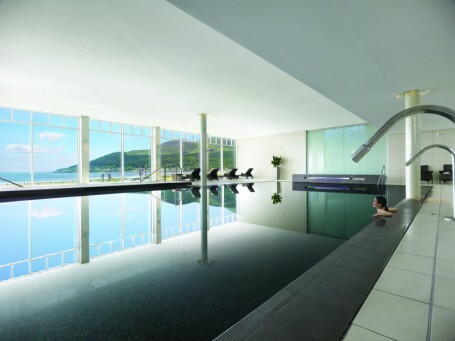 Galgorm Resort & Spa K-2, 136 Fenaghy Rd, Galgorm, Co. Antrim, tel. (+44) (0)28 2588 1001,www.galgorm.com. Picture a tranquil woodland setting with nothing to disturb it but the gentle cascades of the River Maine, and you’ve arrived at this rural retreat. The revamped Resort was opened in 2008 by Ian Paisley and then Irish leader Bertie Aherne following an £11m refurbishment. Take the 40min car journey north from Belfast, turn left just before Ballymena and follow the signs to Galgorm village. Et voila! NB As of Summer 2014, plans are well underway to add more in-demand bedrooms and extend the spa facilites to include a lager, family swimming pool. The Resort's 163 acre parkland encompasses the main hotel, self-catering log cabins and The Great Hall, all combining to create a abundance of overnight and event options. A verdant circuit of walking and jogging routes complete the pastoral scene. The hotel’s 75 bedrooms reflect the Resort’s ‘Gentleman’s Residence’ meets contemporary chic ambience. And the newly-launched Four Seasons Suite is a vision in Art Deco Hollywood glam – perfect for that high-style event. 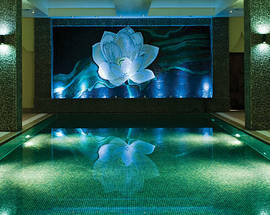 An infinity hydrotherapy pool provides all manner of bubbles and jets to re-energise tired bods. And the adjacent suite of heated cabins serves up several steam and sauna options to kick start your system. Relax in the outside hot tub as you contemplate the River Maine and let the world’s woes drift away... And for a Spa a deux, we suggest you book the Parisian Suite with its supersized twin baths, large aquarium and side-by-side couches. A beer bath, mud serial and chocolate body wrap are among the more imaginative beauty treatments to behold. All this and the over-16 philosophy ensures a child-free environment. Now that’s what we call relaxing. The par-72 Galgorm Castle parkland gem, over the wall from County Hall, Ballymena, is one of the most progressive golf centres in the country. In June 2010, the 6,736 yards Championship layout was given a significant sign of approval by the PGA European Tour, when a EuroPro Tour 54-holes event was staged there. The relatively flat test features many challenging holes that demand the utmost precision off the tee, with teasing water hazards prominently placed. The shortish par four fourth, with water guarding the front of the green, requires complete focus. Of all the rich variety of holes, the charming short seventh holds a special attraction. Club professional Phil Collins also has a suitably equipped practice ground facility of driving bays, sand bunkers, and chipping areas. "Having the EuroTour event here in 2010, and back again in June 2011, proved to be a huge boost not only for our club but also a buzz for the surrounding area - and golf in general in Northern Ireland," said Galgorm official Kirsty Worthington, "Our course has certainly grown in stature, and we have a healthy working arrangement with the nearby Galgorm Resort and Spa. Customers can play the golf course any day of the week. No day is off limits. Indeed, we keep three slots clear for visitors during our busy Saturday Club competition." All that good work at the Spa goes out the window with the belly-busting portions served up at the cavernous and rustic Gillies Bar and Grill. Still, with North Coast Seafood Chowder, Barbary Duck Breast and the ever-popular Bang Bang Chicken up for grabs, we’re not complaining. From Wed-Sun, The River Room Restaurant, with its wine cellar and exquisite views, provides an elegant alternative for fine dining. And Fratelli Italian Restaurant & Bar oozes converted barn charm within the equally delightful Mulberry Garden courtyard. Take advantage of your countryside setting with a ride on one of the on-site stable gee gees. Or book your very own Gillie to land that catch of the day. More indoorsy types can imbibe in cocktail bar training and wine cellar tastings. And just up the road everyone can enjoy historic Gracehill village whose 18th Century Moravian origins are reflected in beautiful stone buildings and a recently-opened visitor centre and restaurant. Roe Park Resort J/K-2, Limavady, Co. Londonderry, tel. 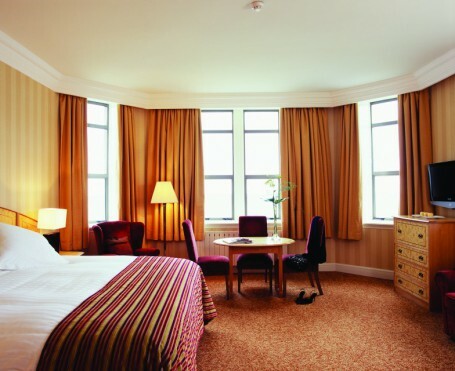 (+44) (0)28 7772 2222, www.roeparkresort.com. 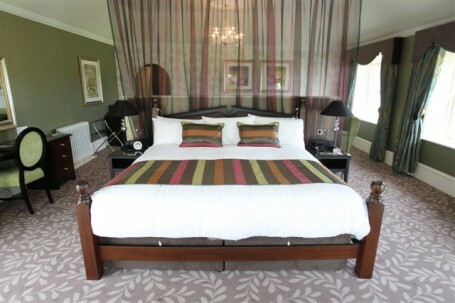 This modern Country House Hotel is set in the peaceful Roe Valley Country Park, just outside the Co. Londonderry town of Limavady. This three-mile linear stretch of river and mature woodland, together with the brooding Binevenagh Mountain plateau, provides a dramatic picture postcard backdrop. A one and a half hour drive North West of Belfast via the dramatic Glenshane Pass leads you to this countryside stunner. The Resort’s 118 bedrooms include five sumptuous, individually-designed suites and fifteen fabulously capacious family rooms. We seriously recommend you splurge on a boutique-style suite to fully experience that luxurious touch. 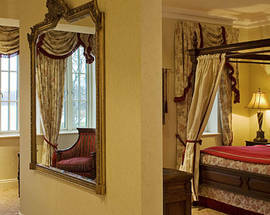 With free wifi and iPod docks, you’ve got one seriously sophisticated boudoir beauty. The Roe Spa menu boasts Elemis facials, wraps and massages, exotic scrubs and rasul mud treatments and delicious bathing ceremonies – go alone or take a pal or paramour for double the fun. Top and tail your spa-time at the Aqua Meditation Chamber and Relaxation Suite. Then take a dip in the indoor pool with steam room, sauna and jacuzzi. Roe Park's first teebox is merely a lob-wedge shot away from the Hotel. This is the most comfortable start imaginable for a golfer needing stress-free fun on the fairways. The downhill par four opener, and the other early holes close to the outskirts of Limavady, help to ease the player into the swing, adequately prepared to cope with some tricky tests up ahead on this undulating par-70 parkland test. Various packages can be obtained, linking the Hotel with the golfing arm of the compact unit - where the professional is Shaun Devenney. One of the many attractive holes is the uphill short sixth. Club selection to this elevated green is a persistent puzzle. Another tantalising hole is the par four 15th. Along with the straightened rising fairway to a new expanded par four 14th green, the 15th - across a drain and near a re-designed pond, can be reached off the teebox by big hitters. The slightest error, however, and the gamble could result in high bogey numbers. The complex has a total of 21 holes. The course normally undergoes a reshuffle during winter months, when reduced to 16 holes. Five holes at the start are given a rest during poor weather. Three standby holes, two par four's and a par three in a field behind the short ninth, come into play. As the name suggests, Greens restaurant offers great food with that course-side view. Local produce is to the fore (pun intended) and it’s a good spot for a bit of mingling with the locals who are equally enamoured of its fine dining menu which includes Game Terrine, Lemon and Thyme Roasted Chicken and Chocolate Truffle Torte. The Coach House, set in a restored 18th century yes, you’ve guessed it, coach house, offers a more informal brasserie-style dining option. 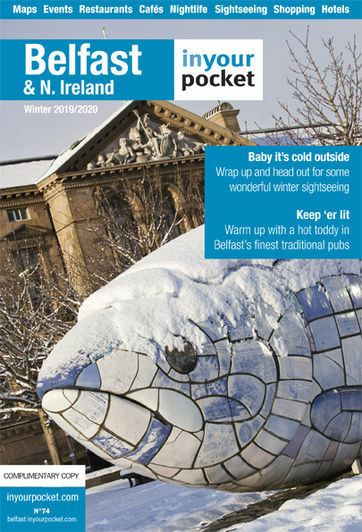 The North West location means daytrips to Derry, Donegal and the Giant’s Causeway are all within easy driving distance. Park your car on the nearby award-winning Benone Strand – a seven mile stretch of Blue Flag sandy beach. Or take the Bishops Road to the summit of Binevenagh and back down to the precariously perched Mussenden Temple. What a sight!